Matang Gonzales, aka. Mat, artist, designer, husband and father of an eleven year old boy, Alex, and an eight year old girl, Haley, graduated from Western CT State University with a degree in graphic design in 1986. He is a fine artist and painted or sculpted his way through school in the new art program being offered at the University at that time. Mat then took his newly honed drawing skills and ability to create and design, and made his mark. After graduation, Mat had several artist apprenticeships, most influentially with James Grashow of Redding CT. He began illustrating for the New York Times and having exhibitions of his work. He had several major shows in NYC, and a received a favorable review in the New York Times. He eventually came back to WestConn to take part in Reflections, the alumni show at Ruth Haas Library in 2002. After a few years, Mat knew he had to enter the corporate art world to start making more money and provide for his family. He began a new venture with Stage Fright Studios in Watertown, CT. He started as a designer and was soon promoted to Art Director. 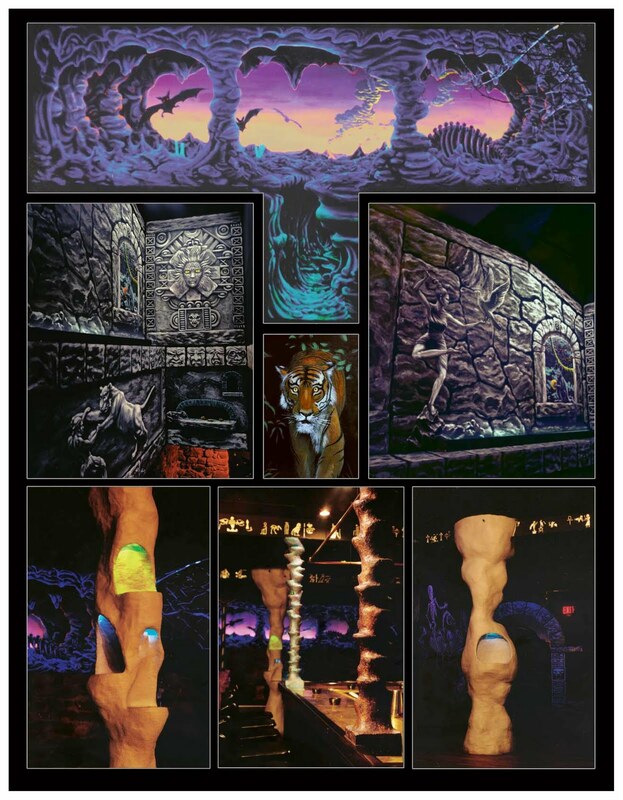 Here he produced elaborate special effects for the scare industry and assisted in the development, creation, installation and management of several haunted venues in the US. He went on to work as a designer at Design Innovation in Avon, CT. He was part of an elite team of talented industrial designers that created consumer items, specializing in toys and infant products. Mat was responsible for concept renderings, presentations, technical layouts, packaging, graphics, breadboards, models, prototypes, molds and sculpture for several major accounts including Fisher Price. Mat said he was trained in industrial design while at Design Innovation. He learned to draw in the "style" using sweeps, curves and ellipse templates. While at D.I., he developed a unique and successful magnetic play set. He went on to become a product designer at Amscan. Here he worked with a variety of materials and provided concept renderings, 3-D models, illustration, design and control drawings for a broad range of consumer products, party supplies, giftware and packaging. He added that some of his designs are still sold in stores at Halloween or Christmas. He moved on to a position as Design Director of ToyBiz/Marvel Toys at Marvel Entertainment in New York City. He created toys for a wide range of Marvel and other licensed characters, including some of the most detailed and articulated action figures in the industry. 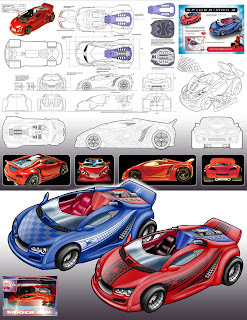 His designs always start with a hand drawn concept rendering which he then scans into the computer for color and specs. Once the design leaves his hands, it becomes the company’s property and design limits are in play due to costs and other variables. The commute was starting to get to him though. He left for work before the kids got up in the morning and returned home when it was almost time for bed. After Marvel was taken over by Hasbro, Mat’s department was cut and then cut again. The interns were able to keep them working for a while but then his entire team was gone. He relied on interns and freelance workers. Mat added that he had Finn Tornquist working as a freelance artist. He felt funny being Finn’s Director but added that Finn is an amazing artist and was a former industrial designer at Raymond Loewy International. Mat watched Finn use his skills to create designs and thought he was amazing. Mat said Finn became a mentor to him. "Every time I watched him, I learned something". Mat added, "Marvel was a challenging experience as there are so many creative people, each trying to make their mark. Sometimes there are too many cooks in the kitchen. I was fortunate because my department relied heavily on drawing skills to design product and was really the only department to have this creative freedom. All of the comic art is now created by freelance artists". Before he worked corporate Mat joined the CT Commission On The Arts as a "Master Teaching Artist". He taught art and 3-D design workshops in schools around CT. "In one workshop, I had students cut and build upon triangular panels, and then paint them with florescent paint. We then took the panels and created two geodesic domes, one inside the other. It was huge as you could go inside both of them. 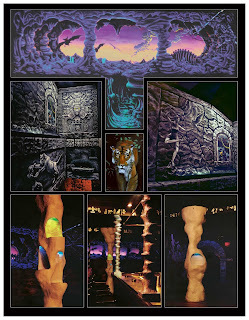 We illuminated the project, inside and out, with several banks of black lights. The final presentation was awesome". He added that he missed teaching. He added, “for me, it’s all in the process when doing a job. I love the conceptual work, in the beginning, before everyone else gets involved with their costs and their changes. Certain clients, like Disney for example, have so many people involved and they all have their own ideas and want to make their mark on a product. [ A commercial artist] cannot take any changes personally. It is very rare that a design is not changed. "I like rendering the art by hand, scanning it in and adding color via PhotoShop. It's important to create files that can be easily reworked. I’ve been working on a winter play set for Tinkerbell. I treated the initial concept as a piece of fine art, and carefully rendered it as I would like to see the final product. I scan it and send the digital file. I get to keep the original art. Next week my work will be taken apart and it won’t be mine anymore." Mat said, "I’ve done two jobs in the past couple of weeks where I comped the fonts by hand just as we learned in Mr Wallace's typography class. Then I went through my fonts and found styles that matched my drawings. This method of typography has become a lost art. I remember Diane Golden’s old type setting machine – it took up half the room." At home, besides his family, and the many activities that his children are involved in, Mat loves music and has played music since he was eight. He sometimes plays guitar with friends but most of the time just to relax. He has his instruments stored in part of his studio, which he built across the street from his home. It's an old blacksmith shop from 1800 that he continues to repair, rebuild and restore. He has room for all his computers, his painting, tools and even some storage space. 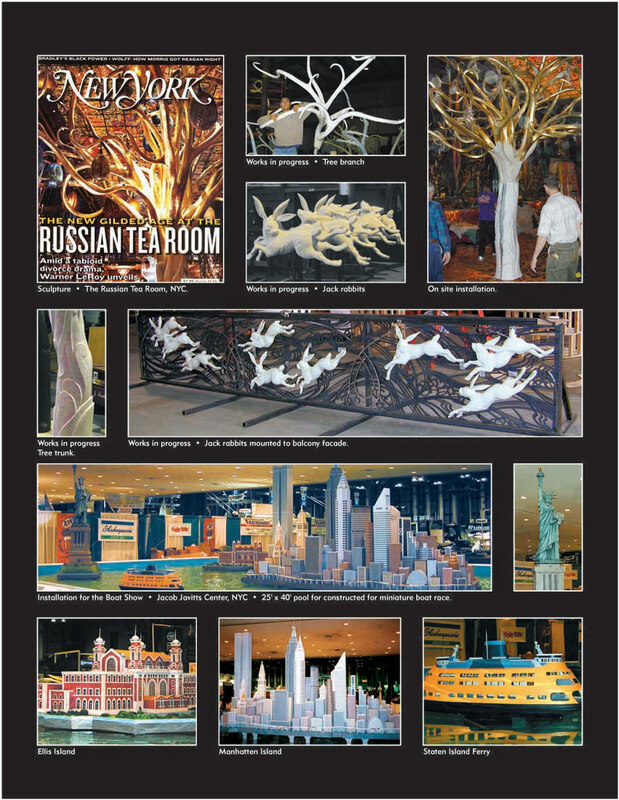 Other accomplishments include several murals, one at Land Rover of Darien, a variety of installations, and a sculpture of a large tree and jumping jack rabbits for the Russian Tea Room. He did this while employed as the head sculptor at an architectural fabrication company. He studied Feng Shui with a master for ten years and this has a serious affect on all life decisions. This should be a big life decision. Mat showed me notebooks full of pictures of his works, toys, concepts, figures and more. I've included a few here, and I have added more to the WestConn alumni site click here to see the diversity of Mat's work.